As one of a few preferred bookmakers on the European market, Novibet focuses on providing equal opportunity access to all its members. As such, they much like an overwhelming increased number of sportsbooks, have opted not to offer a dedicated Android mobile app electing instead to focus their energies towards a fully functional mobile web browser equivalent of their popular and proven desktop site. Its purpose is to give mobile users the same user experience, whether accessing its sportsbook, in-play section, online casino, live casino or virtual sports. The result is a high-quality functioning HTML 5 mobile version web browser site that features an identical range of betting markets and innovative features that mobile users can enjoy. Existing members need only enter their login details after opening a mobile browser of choice and visiting the Novibet mobile site. Those who may be interested in registering a new account can do so by selecting the “Register” button. Is there an iOS .app for download? iOS members at Novibet, much like Android users, shall enjoy the benefits of Novibet’s dedication towards excellence and focus towards providing the most advanced mobile site possible. As such, iOS users will not find a dedicated iOS mobile app offered, but instead share in the same delight Android users experience via a remarkably crafted browser-based mobile version of the Novibet desktop site. It affords the convenient luxury of a cross-platform mobile version that offers each of the betting markets that Novibet users have come to appreciate. Existing users wishing to access the mobile version only are required to open a mobile browser and enter their pre-existing log-in details, while new members need only to register an account. The Novibet mobile site is presented with a substantial number of forward-thinking design features that are meant to parallel its desktop site to ensure mobile members generate the same high-quality betting experience as received when accessing all the great betting options at the desktop site. While using a slightly different colour scheme, the layout and ease of navigation are identical, which ultimately, makes transitioning between the two effortless. All betting categories are conveniently located at the top of the site making the navigation through the sports, casino, in-play and virtual sports a simple process. Furthering the ease of navigation finds a host of information links for promotions, statistics, daily coupons, a blog and live schedule located directly beneath. Adding to that navigational convenience, punters will find supportive links to customer service and a convenient search tool function meant to minimise your time finding sports on interest, particular casino games, live dealer games or virtual sports. While Novibet does not offer dedicated mobile apps, its mobile site version more than compensates for that with a superiorly designed and smooth interface. It equally shares in the success of its sister desktop site by featuring the same high-quality features and betting markets, all of which have been optimised to function to the highest standards. These have also designed for ease of use through thoughtful navigational features that ultimately create an atmosphere that, for many punters, is superior to that of a dedicated app. The number of features is quite extensive, and those most valuable are highlighted below. Novibet, in keeping with its operating philosophy of players first, incorporates into its player-focused features an early cash out feature designed to provide flexibility in the managing of active bets. This feature allows for the early settling on select matches and sports on active bet whereby early settlement will see 50% of the staked bet return to punter bankrolls in exchange for a 50% forfeiture of the staked bet. Perfectly suited for bankroll conscientious punters, it gives a greater level of control over loss management when your bet appears likely not to end in a result favourable to you. The coupon section is another of the innovative features Novibet has incorporated into its sportsbook. It gives punters the unique opportunity to include many events that differ from the pre-determined betting options. As expected, similar to state-run sports betting, odds will be calculated based on your multi-bet choices. 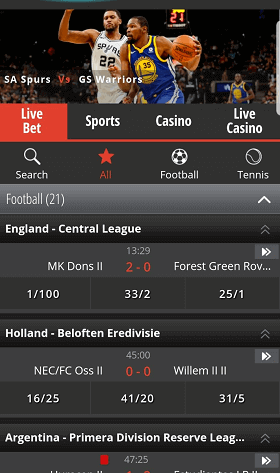 Novibet’s mobile in-play section is vast and one of the more extensive among favoured online sportsbooks. One that will give you unbridled access to an extensive number of sports, it includes soccer, cricket, handball, darts, snooker and other preferred sports. It allows for live betting on in-play matches, includes constantly updated odds, statistical information as well as an extensive range of betting options. Live score is a feature worth its weight for active sports betting punters wanting to stay abreast of the latest results in real time. Novibet diligently works hard to maintain an updated list of live scores and includes multiple features structured within to allow active participants of in-play betting to follow live match scores easily. Those features, which are offered on all sports, include live score results and, for those wishing to study statistics, options on the previous day scores. Unfortunately, while a popular past time for mobile sports aficionados, Novibet does not provide live streaming of any sporting event. In its place, Novibet has opted to offer its live scores section to provide instant updates on all active sporting events, all of which are updated in real time. Another feature that carries value is the Sports special bet section. It provides a compilation of special unique betting options on particular sports such as basketball, rugby, ice hockey and soccer. All specials within this section come with odds that have been enhanced and will be of particular interest to punters hoping to increase returns based on staked bets placed. This highly prized section will provide in-depth, updated statistical information on 28 different betting markets including American football, Cricket, Beach Volleyball, Futsal and Soccer for example. Its real value, when used in conjunction with in-play betting or special bets is the ability to instantly access information pertaining to a vast number of teams, players and leagues. Novibet has further enhanced this by introducing individual player statistical information and subdivided this based on each country, team, and league to provide an invaluable wealth of information. With Novibet’s virtual sports betting section, its status among punters and competitors increased to a different level. Its addition separated itself from others less focused and ill-prepared to adjust to current market trends. The adoption of its virtual betting opened doors to a generation younger who are more accustomed to this style of sports entertainment and the appeal it provides. Virtual betting enthusiasts will be presented with a variety of virtual sports that include football league, football cup, basketball, tennis, and horse racing. Each of those offers the ability to participate in engaging sports event creations ideal for the virtual bet enthusiast. With the extensive betting options at your disposal, there is little surprise that the mobile version at Novibet also features equal quality in the betting products that have become synonymous with the Novibet brand. To provide you with a better understanding of what’s in store for your mobile experience at Novibet, we have chosen to highlight those currently available at the Novibet mobile site. Mobile punters will meet 24 different sporting events packed with an extensive range of betting options for each. Conveniently located neatly at the top of the site, the betslip and all bets placed will be added and calculated making monitoring of active bets an easy task. Punters will have a wide range of sports that can be bet on, including those most popular such Horse Racing, Tennis, Rugby, Cricket and football. The option for those favouring less common sports will allow for bets placed on Water Polo and Handball, with other betting possibilities for Politics, Eurovision and Entertainment categories. Those who enjoy the extensive sports betting opportunities at Novibet may be pleased to learn that an action-packed online casino is part of its available betting options. The Novibet casino is one that stands alongside all others with a generous selection of casino games that encompass modern day video slots to Roulette. Apart from the more traditional casino game categories, punters will have access to progressive slots, video poker, and card games. Aiming to maintain the easy navigation of their mobile products, Novibet have categorised them individually to ensure a truly rewarding experience. While part of its overall offerings, the Novibet casino provides its own promotions geared towards the rewarding of members participation through a variety of bonuses and promotions such as its loyalty and VIP programme. Powered by leading casino game suppliers, punters will be greeted by a gaming library with gaming content from iSoftBet, IGT, Microgaming, Play’n GO, and multiple others. If in need a gambling experience that is more immersive, the Live Casino at Novibet fits the bill, and will most certainly deliver all you have been in search of. While part of the online casino, the live casino receives its own dedicated section and includes Roulette, Blackjack, Baccarat, Three Card Poker, Caribbean Stud Poker and multiple unique live games such as Wheel of Fortune, Dream Catcher and Dice Duel. Staffed by professional dealers, intent on engaging their audience with friendly conversation, it is as close to the action as one can be when playing via their mobile device. The reality of today’s mobile sportsbook is there are few disadvantageous that can be highlighted upon to argue against mobile betting over more traditional methods. There is little doubt that the evolution of mobile version betting sites has come far, and in its development, it has become equal in all ways. That intentional development has allowed Novibet to produce an HTML 5 site that is as reliable, if not more so, than mobile apps whose performance is directly tied to internet speed connections. Ultimately, the advantages outweigh the disadvantages, and for mobile punters, the benefits demand the embracing and respect it deserves. Mobile promotions, or more specifically, promotions geared directly to mobile punters have, for the most part, become a thing of the past. As a modern and player-attentive bookmaker, Novibet understand the importance of offering equal promotions and bonuses to all of their customers. Therefore, all newly registered members to the Novibet sportsbook will enjoy a £25.00 free bet upon successful funding and the subsequent placing of a three-bet accumulator with minimum odds of 7/10. Likewise, casino punters will be welcomed with an initial deposit bonus up to £250.00. In addition to the generous welcome bonuses that form the promotional opportunities at Novibet, punters can look forward to a steady stream of promotions designed to reward loyalty and player participation. Honouring its commitment to ensuring a higher level of service, Novibet has compiled a variety of banking options for the facilitating of deposits and withdrawals. Those featured are a combination of credit card, web wallet and direct banking alternatives that are reliable, proven, trusted and processed using advanced SSL encryption technology. That attention to security ensures the protection of personal information and the secure processing of all transactions. Are live streaming services offered via the mobile version of Novibet? No, unfortunately not. At this time, Novibet has chosen not to include live streaming instead electing to offer live scores that allow punters to stay informed on matches they have active bets placed on. Am I required to have a separate account for the mobile and desktop site? Or am I able to use a single account? No. One account provides access to both the mobile version as well as the desktop. Each will give access to all betting markets, features and options. Am I able to register a “play money” account to test the mobile site before registering a real money account? Yes. As part of its licensing terms and regulations, Novibet is required to allow non-members the ability to access and test their games. While this is more difficult for sports betting, it is easily carried out with the online and live casino. Unfortunately, this option is not offered for the live casino; however, punters are free to observe live dealer games at their convenience. If I claim the £25.00 sportsbook welcome bonus, will I still qualify for the casino welcome bonus? No. Only one welcome bonus per account is permitted. Therefore, it is recommended that you carefully consider your gaming preference before selecting a welcome bonus that is best suitable for you. I have an active account at Novibet, and my roommate wishes to join as well. Is that permitted due to residing at the same address? No. As per the terms and conditions that govern account at Novibet, only one account is allowed per address, IP address and/or computer. This is in place to avoid potential collusion between players and is standard at most sportsbooks and online casinos. My mobile smartphone is several years old. Will it be compatible with the mobile version of Novibet? That will depend on the age of your smartphone and the operating system it is using. While it is recommended that you verify the latest operating software is installed on your smartphone, most will still afford a high level of quality. It should be noted that graphically they may not be equal to today’s latest smartphones. Am I able to get in touch with customer service via the mobile site? Yes. All customer service facilities are available via the mobile version of Novibet. You can speak with a customer service representative via on-site live chat or via email at support@novibet.com. Alternatively, telephone support is also an available option. Am I required to enter promotional bonus codes to qualify for promotions via the Novibet mobile site? No. Novibet does not require the submitting of bonus codes to claim the welcome bonus or other promotional offerings. All promotions are automatically applied to account holder balances after meeting the minimum deposit or betting requirements as stipulated under each bonus’ specific terms. Novibet.co.uk maintains offices at Clinch’s House, Lord Street, Douglas on the Isle of Man. It’s wholly owned by Novigroup Limited and operates using a license issued by the United Kingdom Gambling Commission (000-039440-R-319360-019). Initially established in 2010, its issued licensed grants Novibet to offer online sports betting services, an online casino, live dealer casino and virtual sports to those residing in Europe and several other jurisdictions. Novibet has focused on developing into a competitive brand that collectively meets the needs of punters gambling requirements. It is their dedication towards offering unique features that have afforded them a level of distinction over their competition and their continued efforts to separate themselves from being just another sportsbook that has seen their stature in the world of sportsbooks increase. Those key factors led us on a journey that, when considering its betting options, markets, functionality and navigational attributes, saw us rating Novibet a 9 out of 10.